DVD: Widescreen 1.85:1/16x9; audio English Digital Mono, French & Spanish Digital Mono; subtitles English, French, Spanish, Portuguese, Chinese, Korean, Thai; closed-captioned; single sided - dual layered; 28 chapters; rated NR; 112 min. ; $29.95; street date 10/31/00. Supplements: Supplements: Audio Commentary from Director Sidney Lumet; 16-minute "Revisiting Fail-Safe" Featurette; Theatrical Trailers; Talent Files; Production Notes. 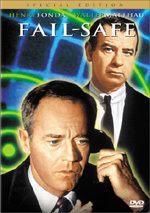 All at once, 1964's Fail-Safe seems woefully dated and fresh as a daisy. On one hand, the film's tale of mechanical failure that risks apocalyptic results is a product of its times. All during the late Fifties and early Sixties, the Cold War raged and Americans feared that nuclear bombs would fall at any time. This attitude actually helped sway the 1964 presidential election toward incumbent Lyndon B. Johnson. Granted, he probably would have won anyway - after the then-recent trauma of the Kennedy assassination, I don't think Americans were too eager to disrupt the administration - but the nation's worries about Republican candidate Barry Goldwater's hawkish attitudes definitely helped the Johnson camp. These concerns were aptly exploited through a famous political ad; in it, a young girl was shown in a field of flowers as an authoritative male voice counted down from 10. Once he reached zero - kaboom! The message was clear - vote for Johnson or die! As such, Fail-Safe was clearly a product of its time. As one who didn't go through that age of the Cuban Missile Crisis and "duck and cover", it can seem hard to relate to the intense fear and paranoia that must have been pervasive. Or is it? I can't speak for those younger than I, but I know that those in my generation - I'm 33 - went through experiences that were at least moderately similar. No, we didn't witness anything as scary as the Cuban Missile Crisis, but the atmosphere in the early Eighties wasn't conducive to world peace. Many of us faced the Reagan presidency with the same fears that would have greeted Goldwater's ascension to the highest office in the land; we were convinced "Ronnie Raygun" would eventually go loopy and cause all of us to go boom. Last time I looked, that never happened, and the collapse of Eastern European communism has lessened fears of nuclear annihilation. Still, those nukes are still out there, and God knows what the future may bring. The concerns aren't as active as they were 20 years or so ago, when projects like the TV movie The Day After tapped into our worries, but it seems unlikely that these fears will ever completely disappear. Unless that day occurs, films like Fail-Safe remain topical. Actually, the movie transcends the nuclear subject, for the picture's also about the dangers of automation. The nightmare depicted in the story doesn't occur due to some psychotic leader with an itchy trigger-finger; instead, everything falls apart because of technical malfunctions that snowball past the point of no return. Yes, the movie does come across as dated at times, but I thought it worked pretty well, at least until the implausible conclusion. (No, I won't discuss the ending, since it might spoil the film for some of you, but I thought it seemed rather far-fetched.) The film boasts a very strong cast, from Henry Fonda as the kind of intelligent, calm, and reassuring president most of us wish we really had to Walter Matthau as an aggressive theorist to Dan O'Herlihy as a thoughtful, peace-striving general. Although a few moments came across as overly emotive, for the most part the cast play it cool and with honesty. Director Sidney Lumet paces the film appropriately and creates a great deal of tension. This is a taut little movie that leaves little room for fluff and extraneous exposition. Actually, that's not completely true, at least on the surface; for the first act of the picture, I felt somewhat impatient because the film seemed to set up the characters in unnecessary ways. However, as the story progressed, I realized that way appeared less-than-useful at the start of the movie became more significant as it continued. Ultimately, Fail-Safe makes for a darned compelling little thriller. Although parts of it seem dated, the message of the film remains important and the impact stays strong. Fail-Safe packs a punch and works quite well. Fail-Safe appears in an aspect ratio of approximately 1.85:1 on this single-sided, double-layered DVD; the image has been enhanced for 16X9 televisions. The movie displayed a number of problems that left it very watchable but generally flawed. Sharpness probably provided the strongest aspect of this picture. Although some mild softness appeared at times, for the most part I thought the film seemed pretty crisp and well-defined. Moir� effects occasionally cropped up in the sides of buildings, and I also saw a few examples of jagged edges. Artifacts from the anamorphic downconversion on my 4X3 TV seemed insignificant. Black levels usually looked nicely deep and dark, but contrast seemed somewhat weak; the image occasionally displayed a vaguely gray cast that didn't differentiate especially well between light and dark segments of the film. Some scenes appeared excessively bright as well. Despite that, shadow detail looked pretty strong, with low-light segments that seemed appropriately heavy but not excessively so. As with many older films, the most substantial problems I found during Fail-Safe resulted from print flaws. The movie opens with some stock footage of a bullfight that looked just horrible; it presented a high number of scratches and other concerns. The image improved after that, though other stock footage - usually viewed in aircraft shots - included substantially greater amounts of defects than the scenes filmed expressly for F-S. Even those had concerns, however. Grain appeared throughout much of the movie, and nicks, grit, blotches, thin vertical lines and speckles cropped up at various times. At times I saw odd "warps" in the image; the picture seemed to display a slight increase in size before it'd shrink back to normal. Shots in the president's bunker fared worst; these came across as very bland and messy. However, most of the movie actually looked pretty decent, and the image merited a solid "C" even with its myriad of concerns. Somewhat more consistent was the monaural soundtrack of Fail-Safe. The film offered one of the most simple mixes I've heard in a while, mainly because it only consists of dialogue and effects; no score appeared. Speech sounded relatively natural and distinct; I faced no problems related to intelligibility, and I detected no edginess. Effects seemed clear and crisp, without any distortion. Overall, the track seemed fairly typical of its era though it came across as somewhat better than average. Columbia-Tristar (CTS) market Fail-Safe as a special edition, and it does include some positive extras. First up is a decent audio commentary from director Sidney Lumet. The worst aspect of this track stems from the many empty gaps that confront the listener; Lumet can go for long stretches without any remarks. However, when the director speaks, his statements are usually informative and insightful. He discusses a wide variety of topics, from the controversies in regard to Dr. Strangelove to his opinions of movie scores to his attitudes toward filmmaking in general. Actually, I don't think the preponderance of Lumet's statements addressed F-S itself, so if you want to hear lots of details about the film, you'll probably be disappointed by this commentary. However, if you'd be entertained by a veteran filmmaker's opinions of a variety of movie-related subjects, then you'll like this track, even though the many gaps make it somewhat frustrating. Next up is a newly-created 16-minute documentary called "Revisiting Fail-Safe". This program provided a brief but generally solid overview of the film's background and creation. It touches upon the political climate during the era, the issues related to Strangelove, and a variety of other topics. We find the usual mix of film clips plus interviews with director Lumet, screenwriter Walter Bernstein, actor Dan O' Herlihy and George Clooney, who acted in and executive produced the recent TV version of Fail-Safe. Ultimately, it's a fairly good show, but it's far too brief to be genuinely valuable. The program does provide two valuable aspects. First, we see almost all of the aforementioned Lyndon Johnson commercial; though this has appeared many other places, it's nice to have a copy of it on the DVD. Also, we see a good split-screen comparison of the similarities between F-S and Strangelove which prove I wasn't just imagining the closeness of the two projects. A few other DVD regulars round out the package. "Talent Files" offer the usual extremely brief and essentially useless biographies; we find listings for Lumet and actors Henry Fonda, Walter Matthau, and Larry Hagman. We get trailers for F-S plus a few other CTS movies; ads for The Caine Mutiny, Das Boot and The Guns of Navarone also appear. Finally, the booklet contains some solid production notes that provide some interesting details not covered elsewhere. Despite some elements that haven't aged well, Fail-Safe generally provides a very tight and compelling drama about the perils of the mechanized nuclear age. The film benefits from taut direction and an excellent cast, all of which help make it memorable. The DVD features fairly mediocre picture with relatively good picture and a few nice extras. Although the disc isn't perfect, it's a nice representation of a quality film.